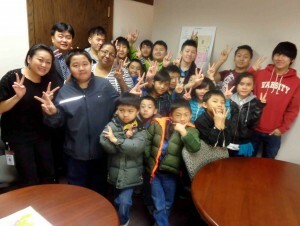 MINNEAPOLIS (April 8, 2014) — Newly elected Minneapolis City Councilmember Blong Yang gave a tour of City Hall to 20 North Minneapolis Hmong students on spring break from school on On March 28. First they crammed into councilmember Yang’s office. Then they walked the passages of city hall. 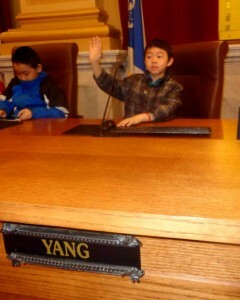 The students got to see council chambers, where for 15 minutes they took over city council. They also saw the office headquarters for Minneapolis police, firefighters, and Hennepin County sheriff’s office. Along the tour, students talked with councilmember Yang about what they wanted improved in their neighborhood, from fixing potholes to fewer gunshots to more soccer fields to less snow. Councilmember Yang talked about how important it was to stay in school, and hoped some of them would follow him as members of the Minneapolis city council. Blong Yang is Minneapolis’s first Hmong councilmember. Many of these students know him better as soccer coach for the Farview Park soccer team. Attorney Blong Yang is serving his first term as a Minneapolis City Councilmember for Ward 5, which includes the neighborhoods of Jordan, Hawthorne, Willard-Hay, Near-North, Harrison, Sumner-Glenwood, and North Loop.